A kanji a day makes your Japanese OK! The Daily Kanji is a once-a-day email containing details of a single kanji. If you learn even one kanji a day, you will master the Joyo kanji in less than six years. 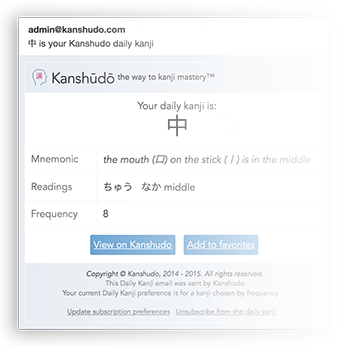 With one click, you can add the kanji to your Favorites, or view it in detail on Kanshudo. The Daily Kanji is completely free! You just need to register with Kanshudo so we know where to send it. REGISTER now and start improving your kanji knowledge one kanji at a time! Registration is completely free, fast and easy. If you are already registered, LOG IN to manage your preferences.